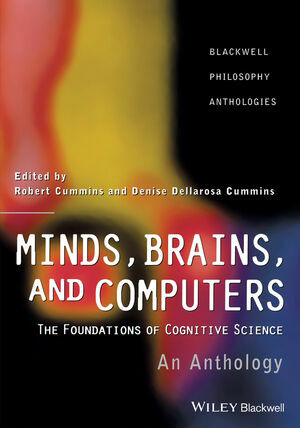 Minds, Brains, and Computers presents a vital resource -- the most comprehensive interdisciplinary selection of seminal papers in the foundations of cognitive science, from leading figures in artificial intelligence, linguistics, philosophy, psychology, and neuroscience. Robert Cummins is Professor of Philosophy at the University of California, Davis. He is the author of The Nature of Psychological Explanation (1983), Meaning and Mental Representation (1987), and Representations, Targets and Attitudes (1996), as well as many articles and several edited volumes. He specializes in the foundations of cognitive science and the nature of mental representation. Denise D. Cummins is Associate Research Professor of Social Sciences at the University of California, Davis. She is the author of The Other Side of Psychology (1995), The Evolution of Mind (ed. with Colin Allen), and Human Reasoning: an Evolutionary Perspective as well as numerous articles and reviews. She specializes in higher cognition from an evolutionary perspective. Part I: The Mind as Computer: Introduction:. 4. The Language of Thought: J. A. Fodor. 10. Computing, Machinery, and Intelligence: M. Turing. Part II: The Mind as Neural Network: Introduction: . 18. Rules and Connections in Human Language: S. Pinker and A. Prince. Part III: The Mind as Brain: Introduction: . 22. Is Consciousness a Brain Process? : U. T. Place. 27. Two Cortical Visual Systems: L. G. Ungerleider and M. Mishkin. Part IV: Special Topics: Introduction: . 32. Précis of the Modularity of Mind: J. A. Fodor. 35. Origins of Domain Specificity: The Evolution of Functional Organization: L. Cosmides and J. Tooby. * Collects the seminal papers that have moulded the theory and practice of cognitive science. * Emphasises the differing conceptions of the nature of mind that underlie both theory and experiment in cognitive science. * Organises the papers around three conceptions of the mind, uniquely illustrating the interlocking nature of the contributions from the various disciplines in the cognitive sciences.